BANGI, 3 August, 2010 – Thirty one female students of Universiti Kebangsaan Malaysia (UKM) became foster children to families of different races in a Multicultural Exchange Programme for four days which ended last Sunday (Aug 1, 2010). The programe involved the Women’s Association of UKM (SUKMANITA) and The National Council of Women’s Organisation (NCWO). It aims at integrating UKM students of various racial and religious backgrounds by having them stay with foster parents of other races and religions to help them better understand Malaysians made up of various races, cultures and religions. What was carried out under the programme was different from the foster children programmers with students living with foster parents of the same race and professing the same religion in the kampungs. NCWO President who is also the Vice Chancellor of UKM, Tan Sri Prof. Dr Sharifah Hapsah Syed Hassan Shahabuddin, who was present at the sending off ceremony last Thursdday (July 29, 2010) advised the students involved to make full use of the opportunity to learn about the different cultures and sensitivities of the various people of the country. She reminded them to use English when speaking to their foster families to help them sharpen their usage of the language. 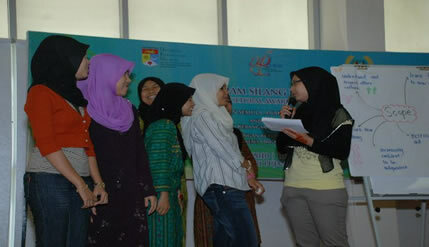 The first such programme was launched in May 2009 and involved the female students and committee members of SUKMANITA.